The Model AE-02 is a carefully machined cutaway of an aircraft piston engine. There are two models available; Model AE-02-4 is a four-cylinder engine cutaway, and Model AE-02-6 is a six-cylinder engine cutaway. 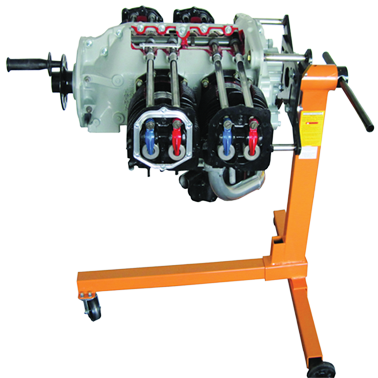 We also accept special requests for a specific make and model engines cutaway. The Model AE-02 can be operated with a hand crank to show the internal mechanism and working of an engine, which includes piston action and valve action. Model AE-02M is a motorized version which is rotated by an electric motor to show the inside view of the operation of an engine. The cutaway is mounted on a mobile stand. The engine cutaway can be supplied with a high quality computer based training (CBT) courseware at an additional cost. The CBT covers the reciprocating engine construction and operation in detail with rich multimedia contents. The CBT may be used by students for self paced learning, and it may also be used by instructors to present high quality graphics and animations during the classroom lecture.